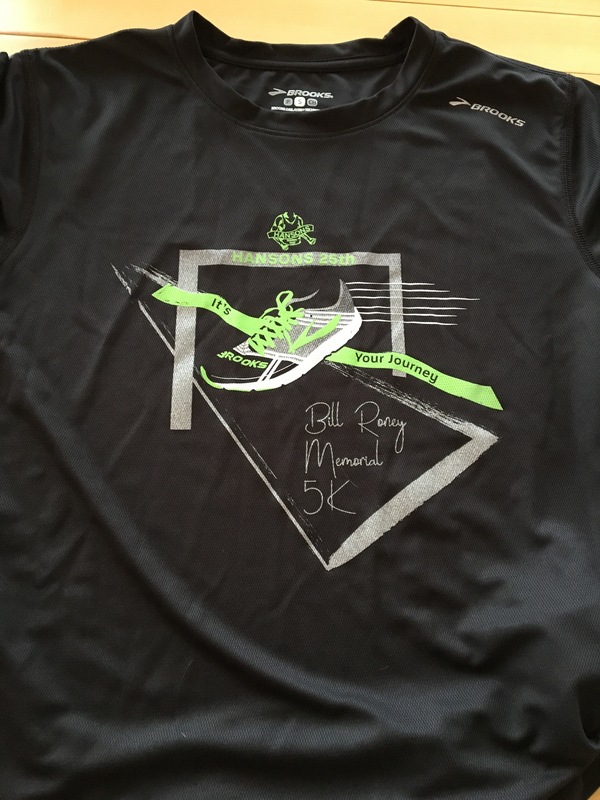 Yesterday I ran the Bill Roney Memorial 5k in Utica. The Friday before reached a high of 72 degrees Farenheit. But in the morning it felt in the high-30s. And it was pouring rain. But that didn’t stop us runners from getting out of our warm beds. Sleeping in these days for me means 7am. With the close proximity to home and a 10am start time, I’ll call it sleeping in. I checked in, grabbed my bib & shirt, ran into my friend Renee, & returned to my car. Check-in was held at a school/church. There didn’t seem to be many places to huddle about and be sheltered from the rain. Two years ago while I was marathon training, I started running with a baseball cap. I found it wasn’t as annoying as I thought it would be. Who knew!? What was I thinking?! As I was walking out the door I thought about grabbing it- I despise rain running into my eyes. I waited in my car for a half hour. I think so many other people were in their car not because they were being anti-social but because of the weather. For our paczki run we waited in the car; my mom and I had arrived ridiculously early and it was bitterly cold. Also since the paczki run, I’ve attended a couple Hansons speed Tuesday workouts (thanks Dani!). I’ve met some new- dare I say it!- friends. And while I might’ve dreaded some of these workouts in high school, I actually have been looking forward to them. It feels so good to run hard and be pushed by others in the group. I’ve also hit 20 miles/week for March. Once I got out of my car, I saw and talked to some of my ‘new friends.’ In the rain. And afterwards, too. The 5k was flat and fast- winding through side streets lacking potholes. I ran 26:05 (8:08, 8:34, 8:34)- over a minute off from last month’s 5k! But I’m bummed I didn’t stay long enough. Turns out I had an age group award. Why didn’t I go inside afterwards?! What was I thinking?! And I could have met Olympic Marathoner Desiree Linden. I mean it’s not like I cried while watching her, Shalane Flanagan, & Amy Cragg race in Rio, or anything. I tell all my friends: there is nothing quite like watching a marathon. Renee got a picture with Desiree!